There will be entertainment and activities for the whole family including Morris dancing, Punch and Judy, Jigabit ceiliah band, children’s crafts and activities, face painting, free giveaways and Snappy the dragon. All activities are free. St George and patriotic fancy dress is encouraged and there will be a prize available for the best costume. As in previous years the Hinckley District Scouting Association will also be parading through the town with representatives and flags from groups across the borough totalling nearly 300 children and young people. The parade will leave Argents Mead at 1:15pm. 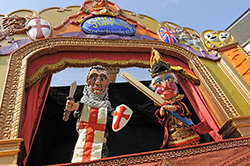 This is the 14th year that the Borough Council, supported by the Town Centre Partnership, have organised events to celebrate St George’s Day. It is a popular annual event that offers something for all ages to experience while enjoying the town’s shops and bustling market stalls. For the first time we will also have a stilt walking St George with dragon, face painting and a range of arts and crafts stalls.